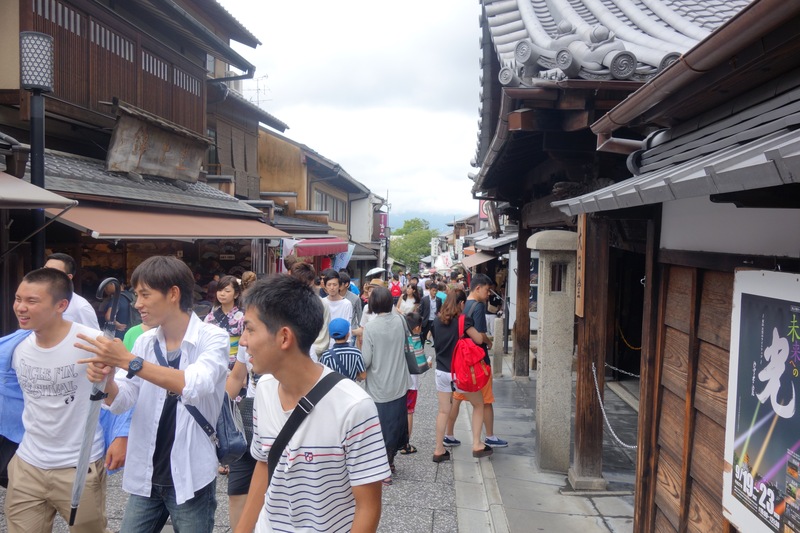 I’m freewheeling in Kyoto for a while. It’s one of my favourite cities to visit. 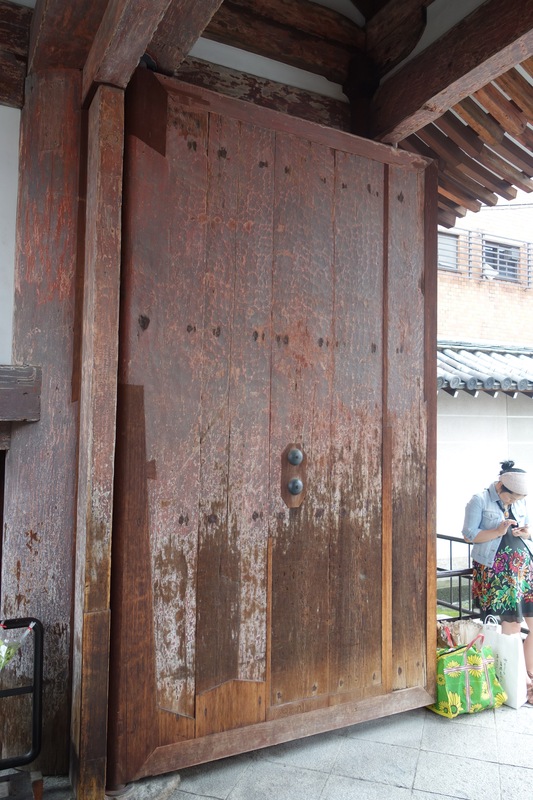 Its small enough to be walkable to most places. A long walk sometimes, admittedly, but then there is an excellent bus and train service that can get you to most places that are a little bit out-of-the-way. 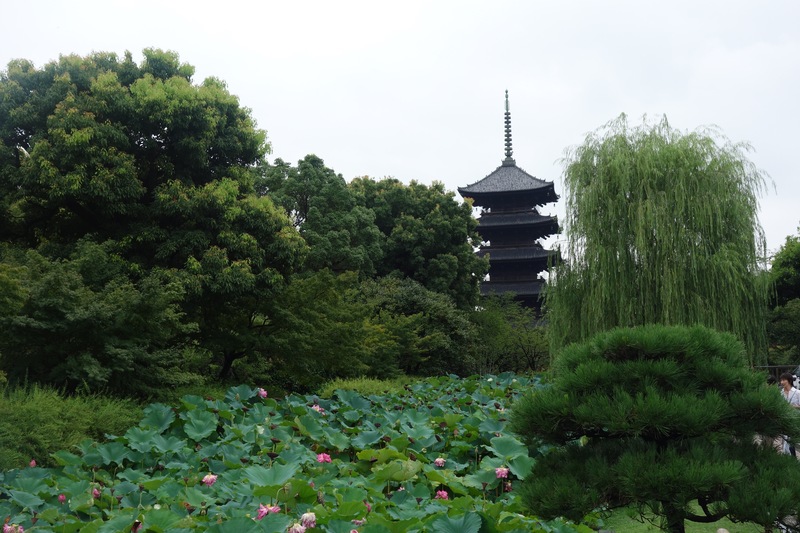 It’s quite central to my other interests, as Nara, Osaka and Shigaraki are just short train rides away and good for a day trip. 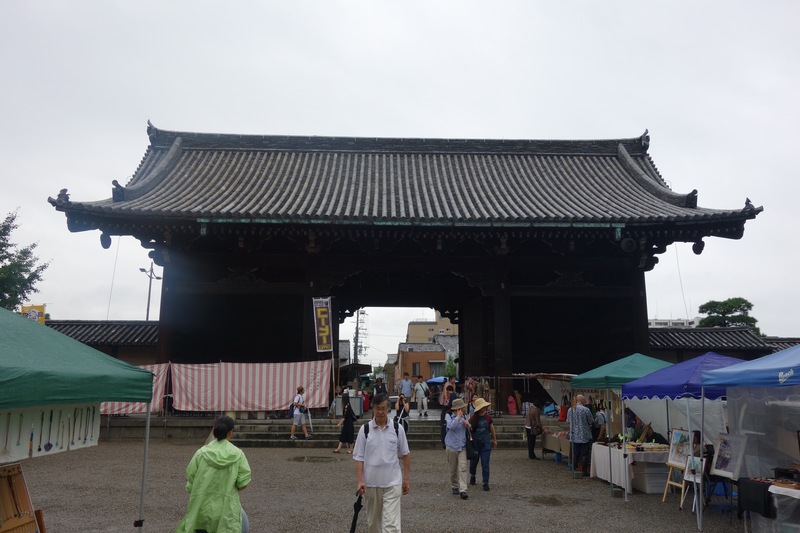 There are more temples and shrines than you can poke a (chop)stick at. I have a few favourites. 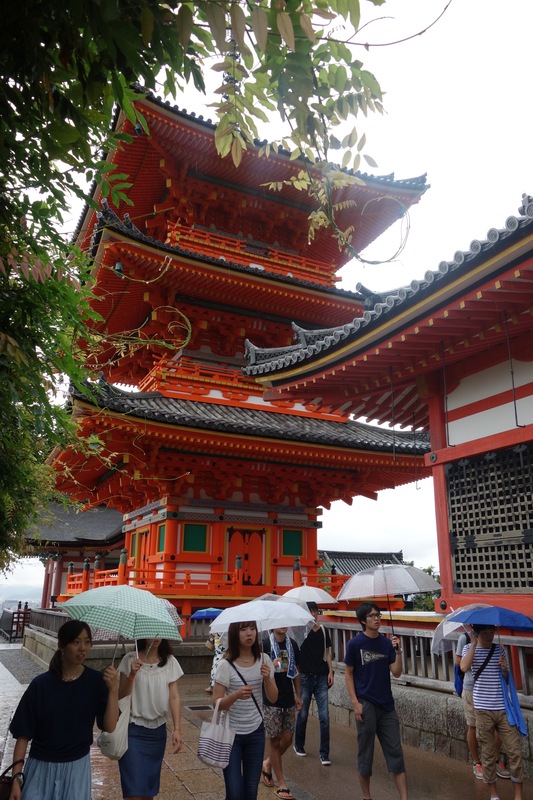 But Kiyomizu has to be one of them, as it is easy walking distance from the centre of town or the main station and the roads that lead up to it are a very interesting days entertainment. No matter which way you approach it, there is always something of interest. 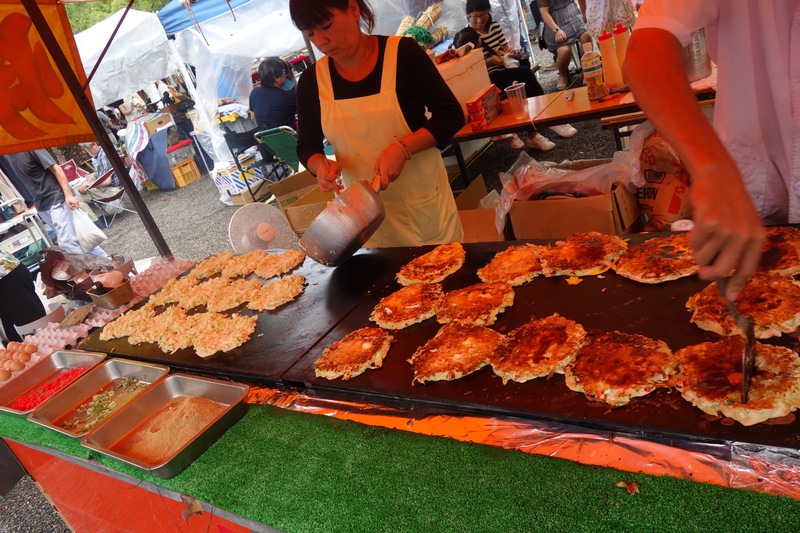 Because it’s so close to town, it is alway very busy and crowded. A minor drawback. 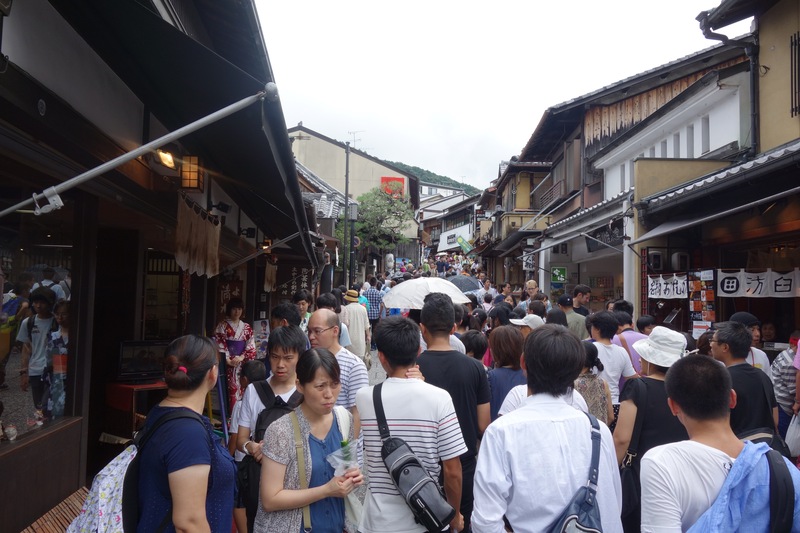 On this visit to Kyoto, I’m searching for some tungsten carbide tipped pottery turning tools for working with porcelain. 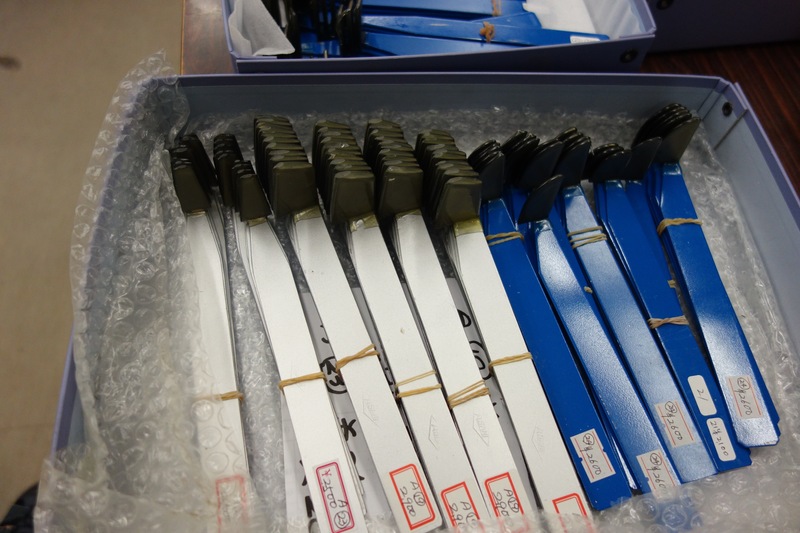 They are very specialised tools and a bit hard to find. Actually a lot hard to find! It seems that they are only made in 3 places in the world. Nevada in the US, but the style of those tools are not really what I’m after. Plus his web site isn’t working at the moment and the guy is moving shop currently. 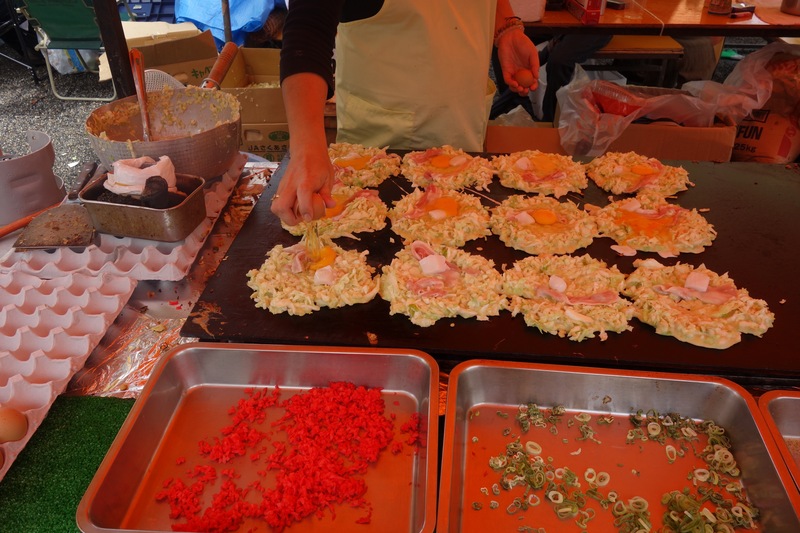 Then there is a place somewhere in China, but I haven’t been able to locate just where. Whenever I came across some of these tools during my resent research trip, I was told that the tools were from ‘somewhere else’, then when I got to the ‘somewhere else’ they told me that it wasn’t there, but where I’d just come from? Now I’m in Kyoto and tipped off by my friend Alistair back in Australia, who trained here some time ago, actually many years ago. I hope to track them down here. Alistair doesn’t know the address, but knows someone, who knows someone, who apparently might know. I’m onto it, nothing like a false start and a dud lead to peak my interest. I like a challenge. 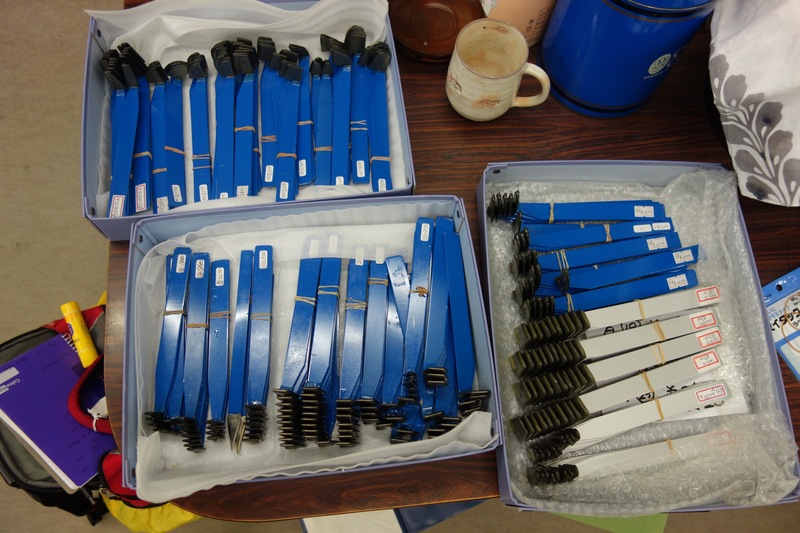 When these tools do turn up in Australia, they are terribly expensive when they do, exceeding $100 each. 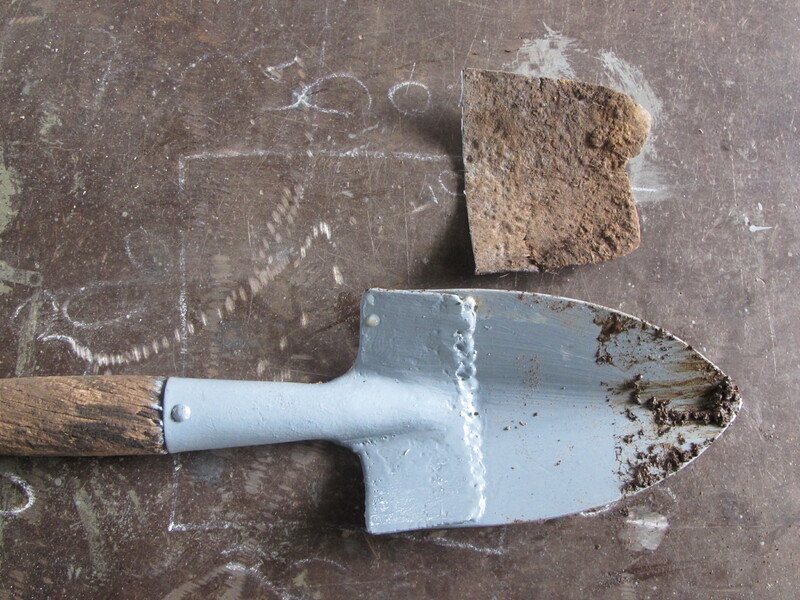 A lot for a small, simple pottery tool. They shatter easily if you drop them, and chip if you hit them against something hard by accident. But they are unbelievably hard-wearing and long-lasting, as long as you look after them. I only own one of them. So, I set off on my long march. 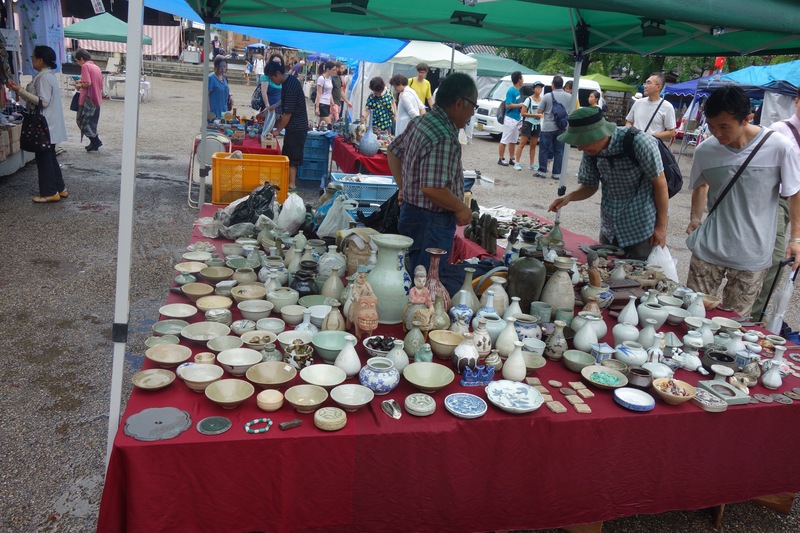 Firstly, I tried to find the ‘Iwasaki’ pottery supply shop that Alistair’s potter friend mentioned. But nothing came up in google maps for that address. So I asked the very helpful lady here at the guest house, where I’m renting a room. She rang them and got a detailed description of where it was. I walked there. I found it pretty quickly, but it was only a small supply shop with not much choice and no carbide tipped turning tools at all in stock. However, I bought 2 small brushes and standard carbon steel turning tool. The guy behind the counter didn’t speak much English, but managed to understand what I was looking for after a while. ‘Tungsten carbide’ isn’t a word that I know in Japanese, it takes a lot of charades to get that one across. But just at this time, another guy who apparently works in the shop turns up and he can point out on my map, more or less, the area where I need to go. Unfortunately, it’s off the detailed part of my tourist-guide map and into the grey. There be dragons! Yep. That part of the map. I’ve never been to this part of town, so have no mental guideposts for it, but it can’t be that difficult. Can it? It’s a long walk and it’s a hot steamy, humid late summers day. I manage to work up quite a sweat by the time that I get to where I think that it ought to be. Only to find that it isn’t there. I can’t find it, after all No one that I ask, seems to know. I think that it ought to be up this hill on this road somewhere. I’m only half way up this hill and I’m already feeling a bit ‘over the hill’. So I ask a passing bloke. He doesn’t understand me at all, and he can’t read my map. This is an isolated part of town with few passers-by. So I sort of give up and begin walking back down to find someone who can help me. This is when I come across a couple taking their groceries into their house from the car. I ask again, show him the name and he seems to know what it is and where it is. This special place that I’m after. He goes into the house and comes back with a ‘Gregorys’ type street map book. Lots of detail. He shows me where it is, and I was very close, about 300 metres away but in the wrong street. It turned out to be down and around a lot of small lanes off the main street. He draws me a map of the local lanes, and off I go into the back lanes, left, right, second left, then right again, just where he said. I take careful note of all the turns and corners so as to be able to find my way back OK. The people in there, didn’t have much English either, but the lady managed a bit, especially when I showed her the tool that I just bought. 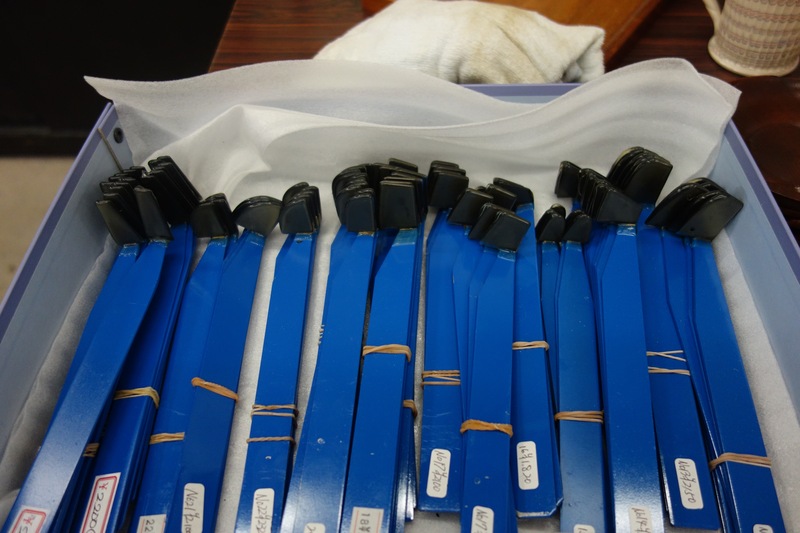 It all ‘clicked’ into place and out she came with 3 trays of carbide tipped turning tools. Kan-na. 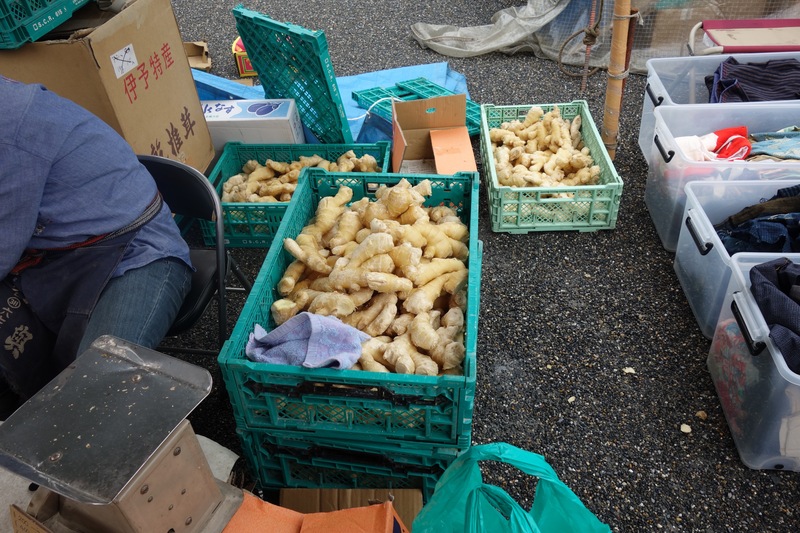 I bought 5 different shapes from around Y2,500 to 3,800 yen each. That’s somewhere around Au$30 to 50 dollars. I then had to walk all the way back. Somehow, the return journey is a lot easier. It’s not just because it’s all down hill, and matches my career. No, it’s because I succeeded in doing it, more or less, on my own, even though I had a lot of help. Thanks Alistair, Aki, Yusushi and Kahori San. My home-made ground bai tunze porcelain stone body is just like throwing with fine sand and water mixture. It is very tough on the fine razor edge of my turning tools. Especially because this kind of ceramic paste ‘clay’ body. 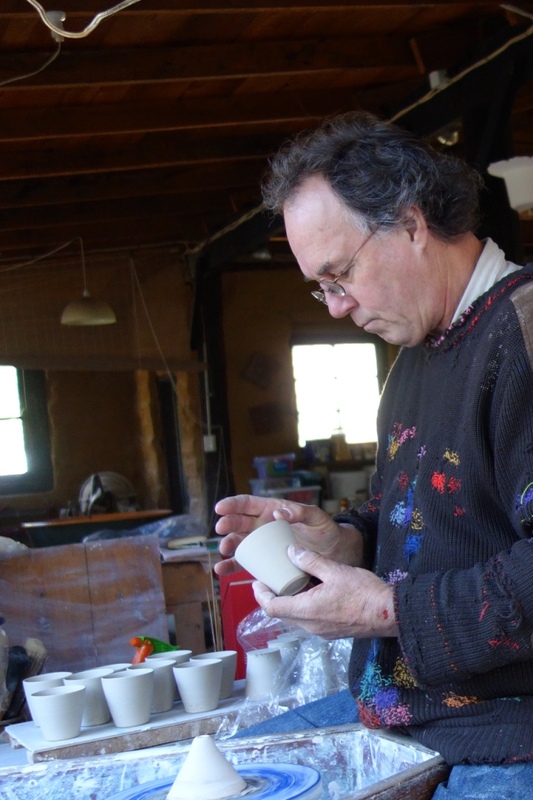 and I use the word ‘clay’ here not as a description of anything plastic and workable, but as a generic term to describe what a potter works with on the wheel. My own particular native porcelain stone is a hard igneous rock. I collect it in chunks from a very small hill, or a big mound, where it has pushed up through the ground in some sort of volcanic activity. Too small to be called a hill, and larger than a mound. I decided to call it a knoll. That sounds just about right. Because it is mostly composed of felspar, which melts in the potters kiln at high temperatures to be a tough glass, I decided to call it the glassy knoll. Now, because it hasn’t been ‘weathered’ or degraded by the elements as yet, it is very dense and hard. It needs to be broken down in two stages in a couple of different rock crushers, first into gravel size, then into small sand sized fragments. It is then ground for hours in a ball mill before it is fine enough to work with. It does not have very much clay mineral in its make-up, so I add a small amount, 1%, of bentonite to my mix. Bentonite is a very fine sticky clay material that I get from Queensland. It is quite a rare material, and one of the few ‘exotic’ minerals that I buy. In the US, they seem to call bentonite ‘V’ gum. I don’t know why, but it’s an interesting name. 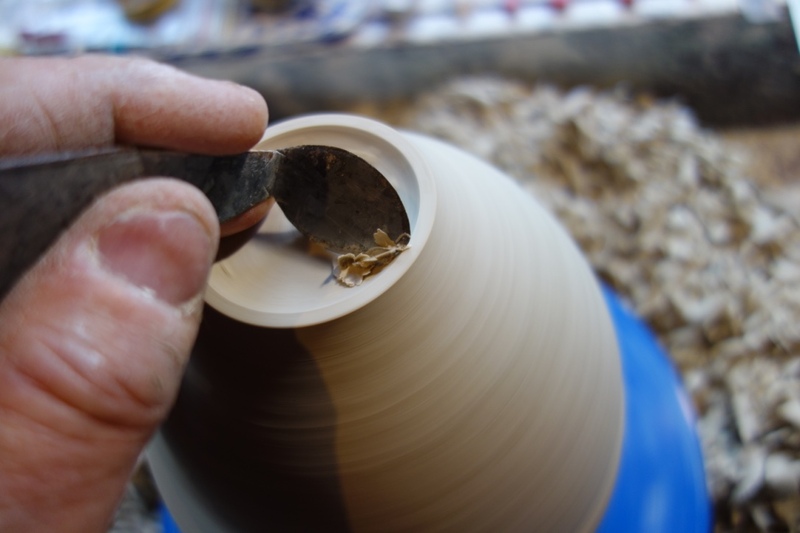 This ceramic ‘gum’ helps to bind it all together, a bit like a glue, so as to make it a little more responsive on the wheel. How it all works, such that it makes a native rock, that I can pick up off the ground , into a translucent, hard porcelain, is amazing to me. There is probably a conspiracy theory about it somewhere on the web? So I have decided to explain it by calling it “The single gum theory from the glassy knoll”. That should quash any hint of conspiracy! 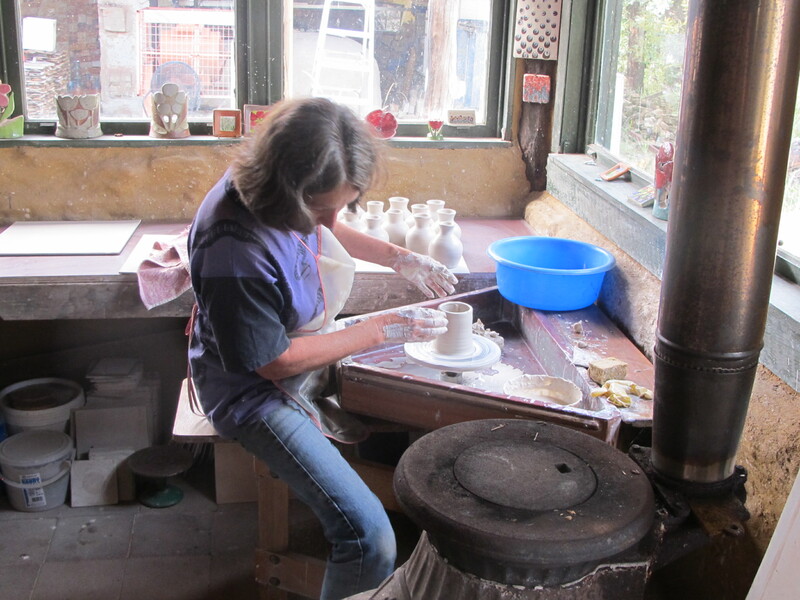 We have our pottery back to ourselves again now, so it’s back to the wheel for us. We work at our kick wheels, set either side of the old pot belly stove which has been generating a steady gentle heat to keep us warm on the coldest of days for the best part of 40 years now. I’m amazed at how it has kept on going for so long with only minor repairs. 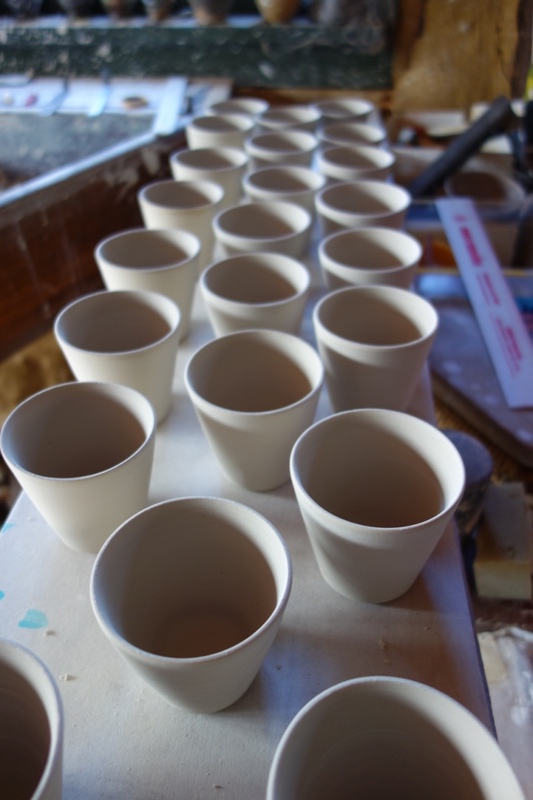 Throwing pots out of these ground rock ceramic pastes is a slow process. We have to plan ahead so that everything must be thrown thicker than you might like and then there is a lot of turning to be done. Some times we rough the forms out on one day, then let them dry overnight until they are almost completely dry, before finishing them off to the thinner desired cross-section. They can’t be bone dry, or they might break under the pressure of the turning tool, but they can’t be damp either, as then they will chip and tear. 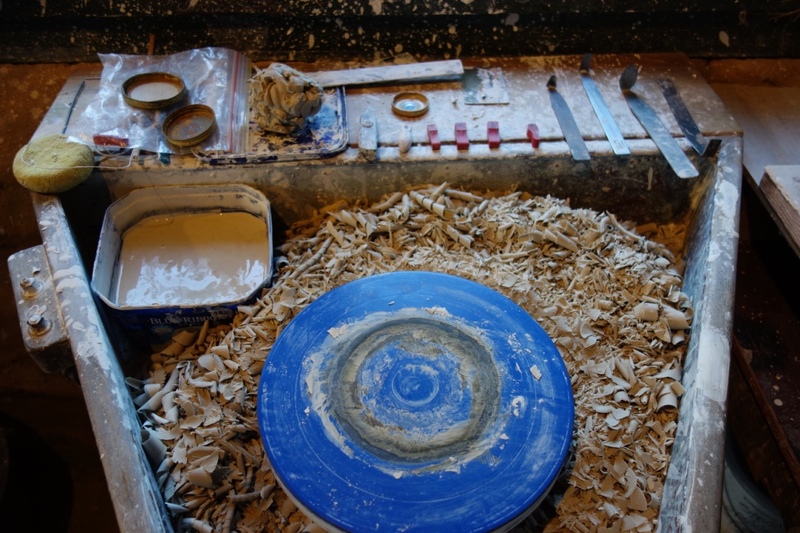 Milled rock paste isn’t like ordinary clay. It’s just not very plastic. It needs to be turned just before bone dry. Grinding away at what is essentially sand and water mix really takes the edge off my home made metal strip turning tools. I have to resharpen then after every 2nd pot, just to keep the edge keen. The garden is starting to respond to the increasing day length and the hint of warmth in the air. 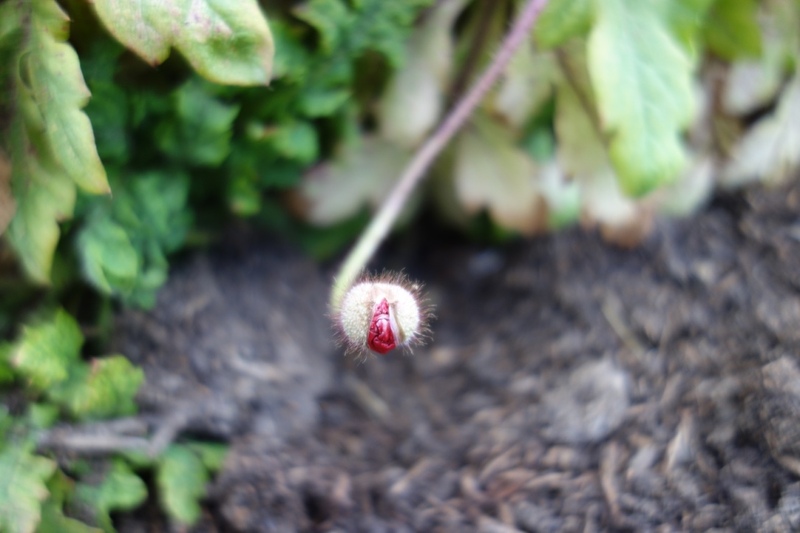 I can see a poppy bud starting to show some red colour and there are swelling buds on the blueberries. 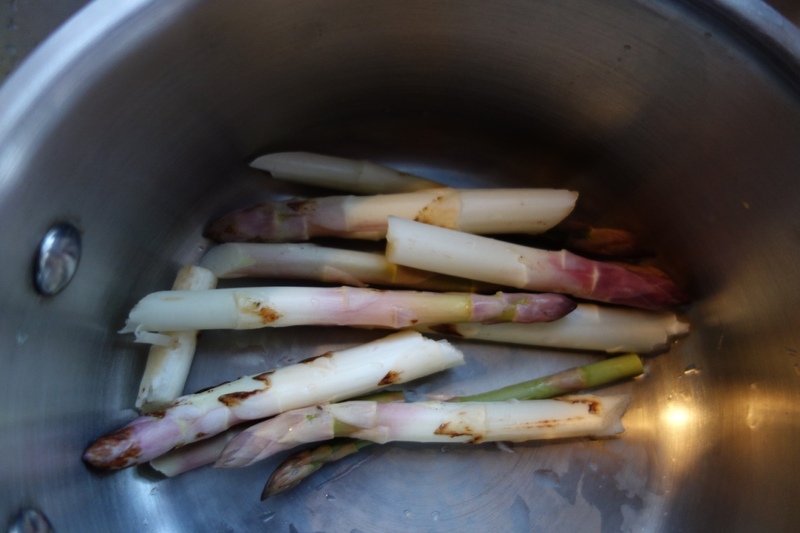 We have just picked our first asparagus spears as an aperitif before our other vegetable dinner. 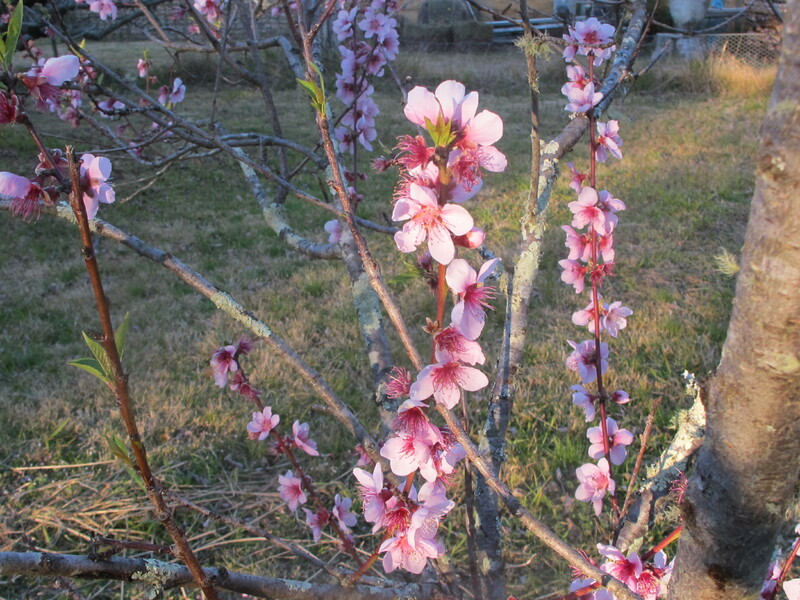 These are all good signs of the warmer spring weather to come. 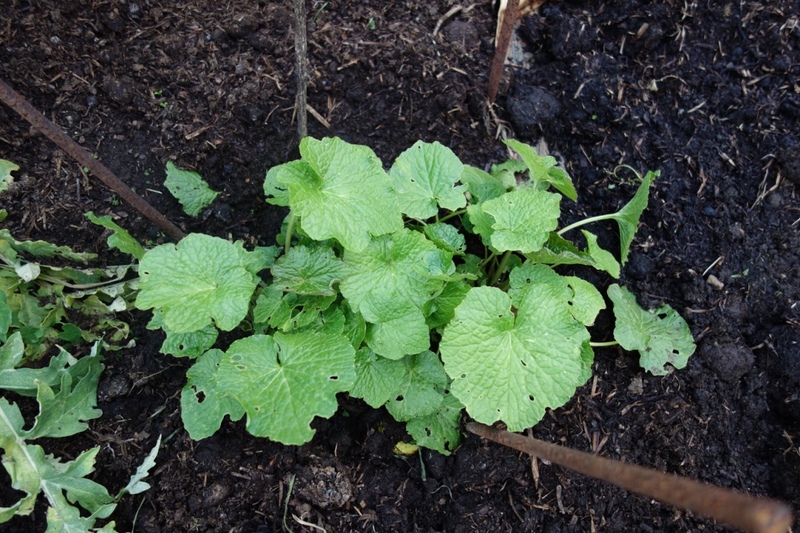 The Japanese Wasabi plants have grown well through the cool wet of the winter and are looking good right now. It’s that hot dry summer heat that knocks them around. 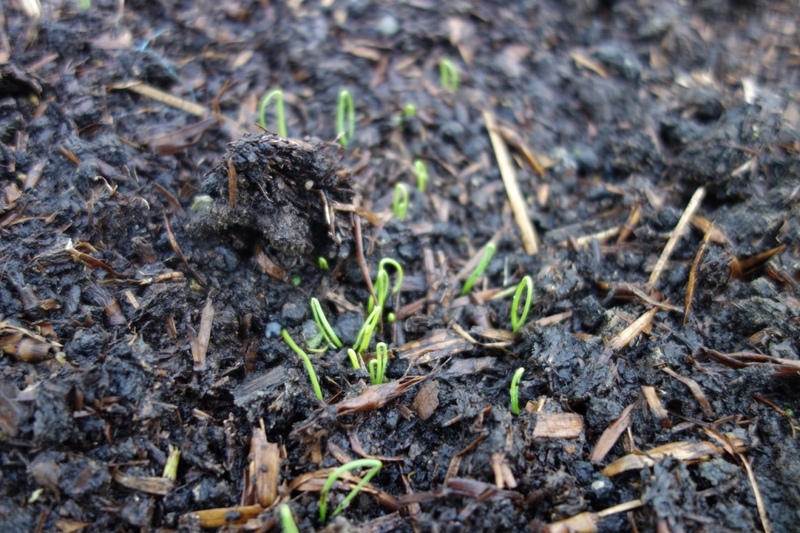 I planted onion seeds 2 months ago. A lot of it came up on time, but for some reason, one packet of seed, just sat there and did nothing until now. This variety must need warmer weather to germinate. 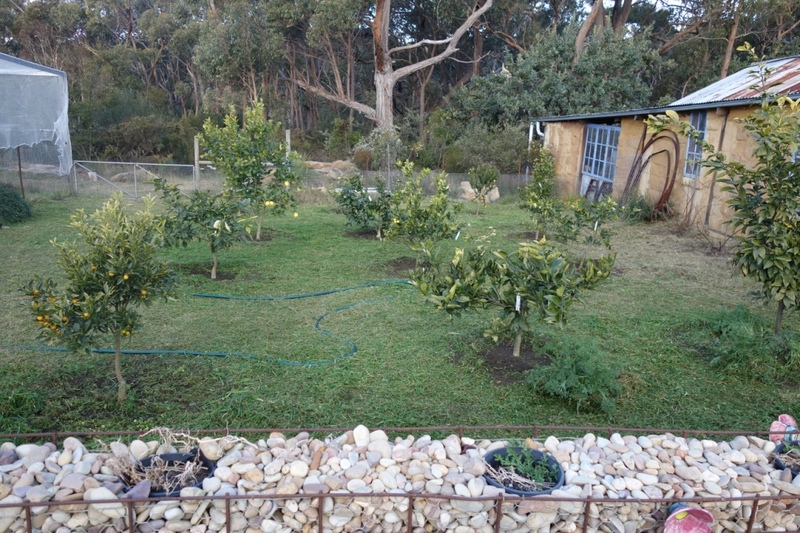 all the other plants are now 100 mm or more high. 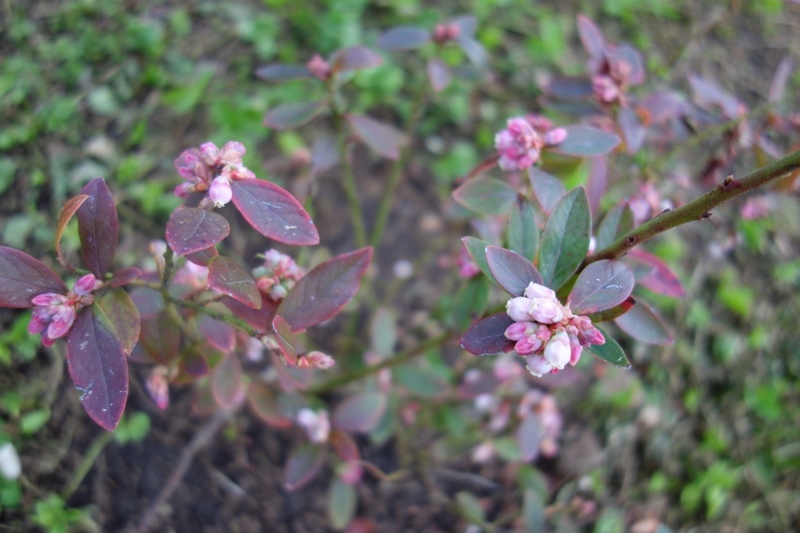 I hope that these plants can get enough growing season before it gets too hot and dry for them in the summer? 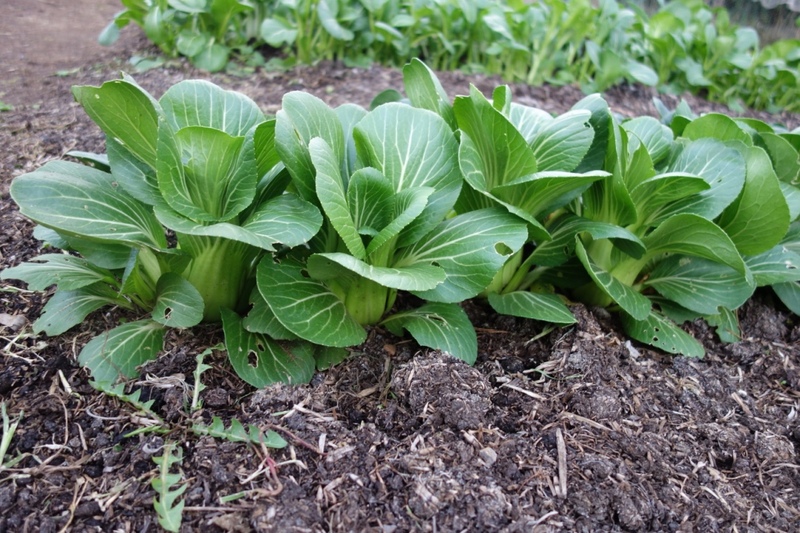 Just down the row a little we have a nice crop of Pak Choi, lovely for stir fry, or just steamed with a little garlic, ginger and soy. 2 mins and melt in your mouth, with still some nice fresh crunch in the warm but fresh and crunchy stems. 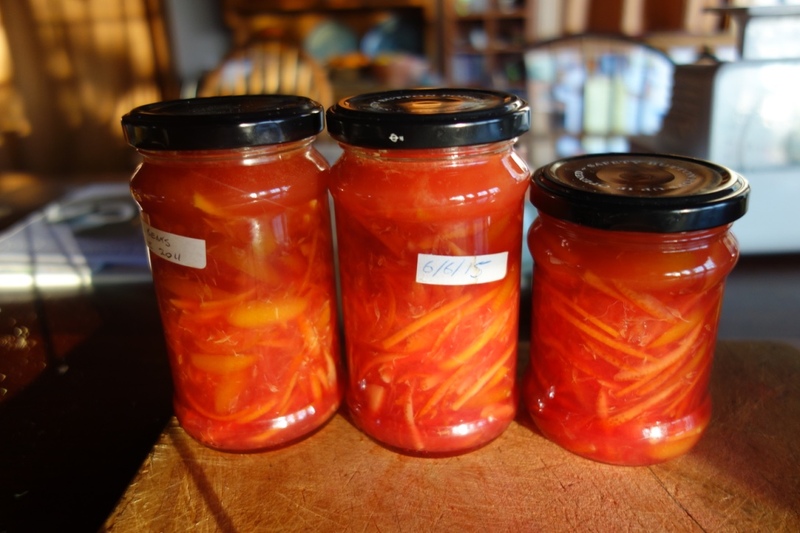 I have made what is probably the last batch of marmalade for this year. 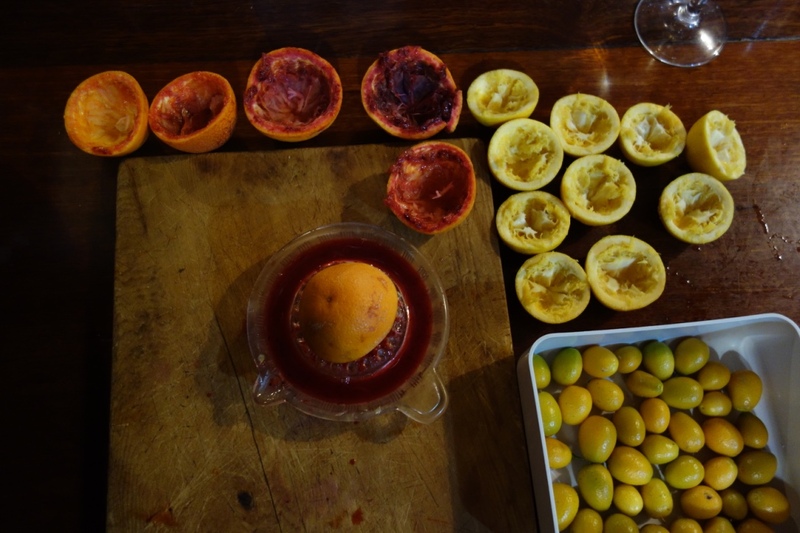 As the citrus season has all but come to an end. I make a batch of cumquat. 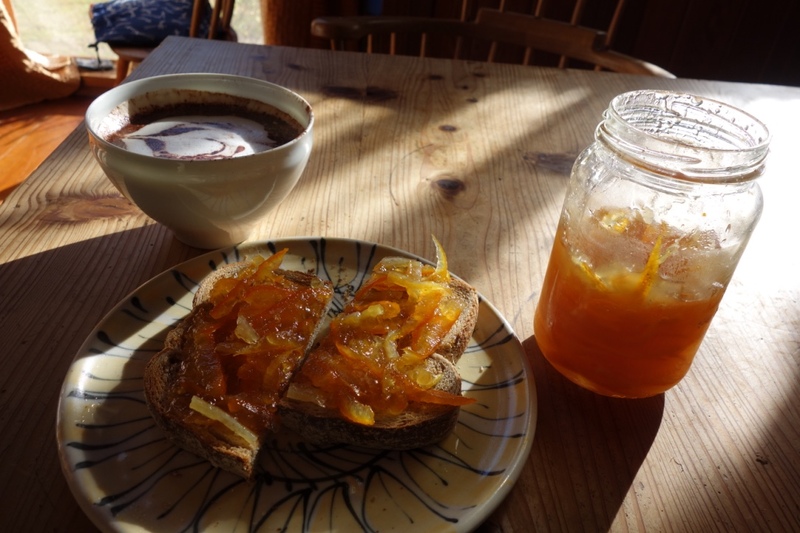 blood orange, and lemon marmalade. I finish it off with a dash of whisky before bottling. 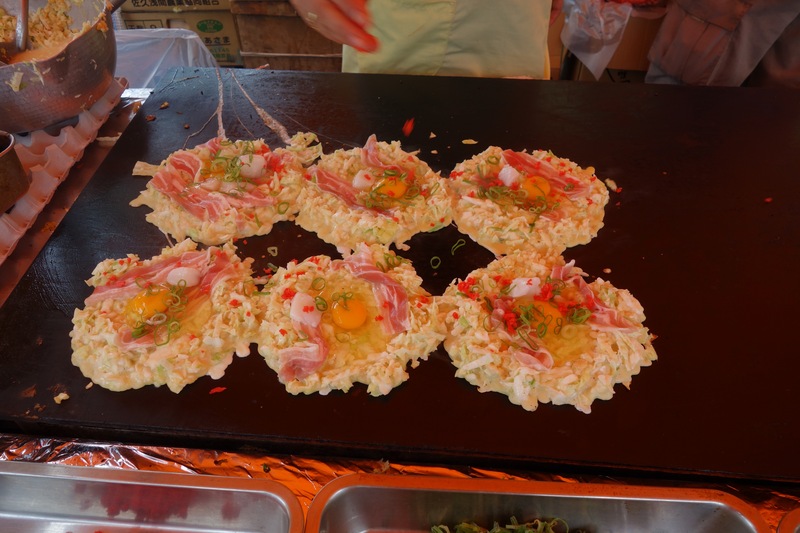 It’s unusual, it looks great and tastes better. 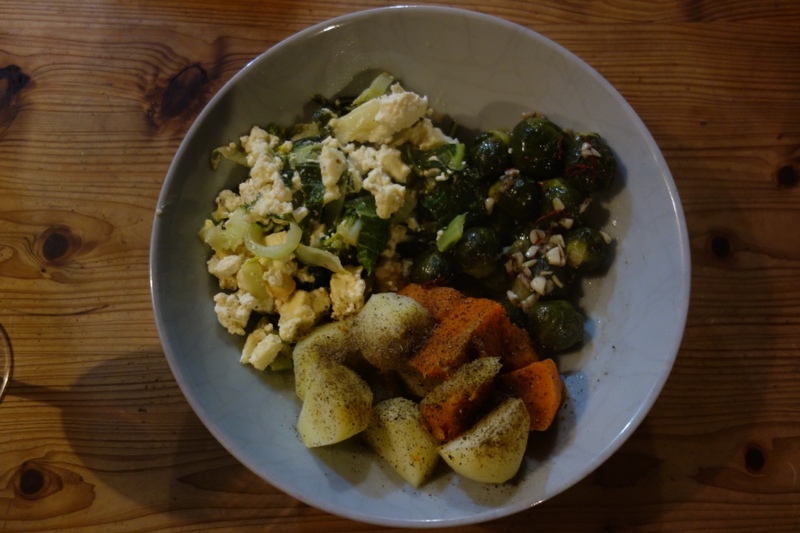 tonight’s dinner is spinach with ricotta, Brussel sprouts, initially lightly steamed, then finished in a pan-fried with garlic and chilli, served with steamed potato and pumpkin. 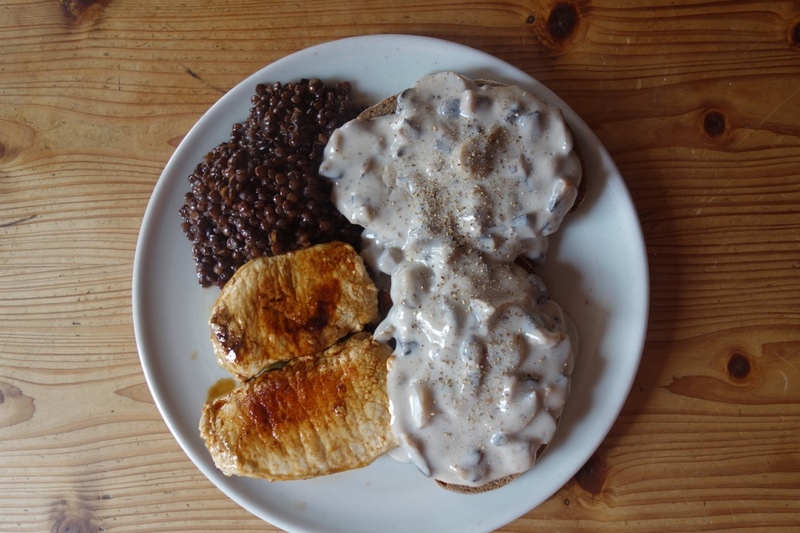 Another recent meal was pork medallions pan-fried in olive oil and garlic, he deglazed with a splash of a nice chardonnay, served with lentils simmered in home-made marrow bone and veggie stock, then plated up with mushrooms in white sauce. We have plenty of cauliflower, broccoli and Brussels sprouts at the moment, as the winter chill weather draws to a close. 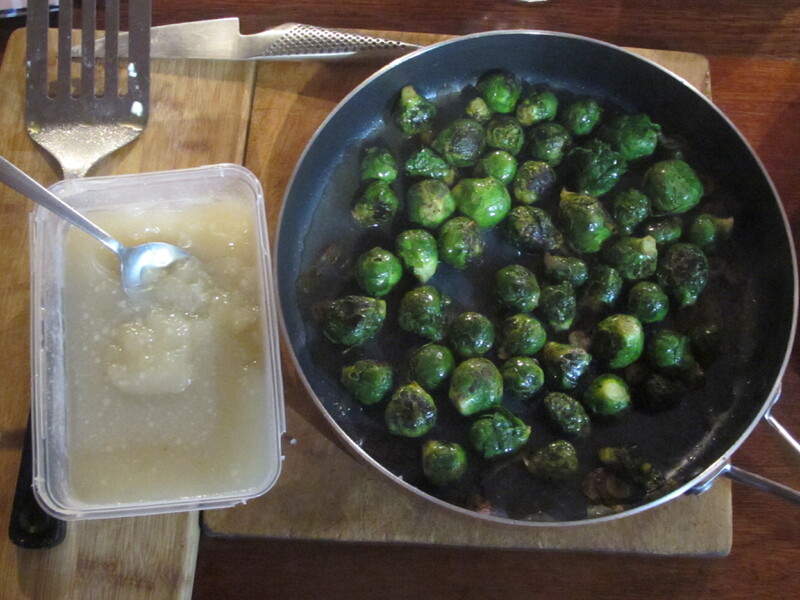 I have been enjoying lightly steamed Brussel Sprouts, which are then pan-fried in some home-made stock. In this case chicken stock, and finished with a little sesame oil and pan-fried and tossed for a few minutes. 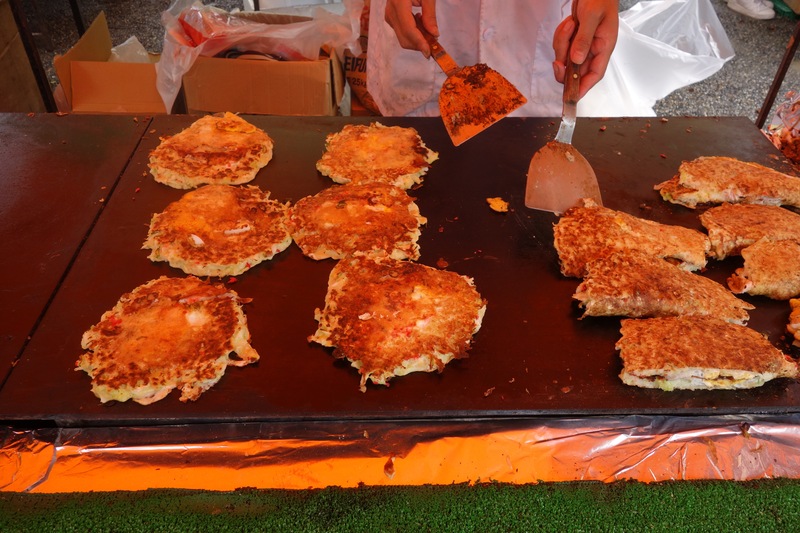 They get a few caramelised spots on them as they roll around, a slight grind of fresh pepper and some vegetable salt. Delicious. No better way to enjoy the crisp cold of winter. There was an article in a recent issue of ‘New Scientist’ magazine. (No. 3032, 1/8/15) That told of the health benefits of eating bitter foods like Brussels sprouts. The Brassicas have several bitter phytonutrients that are produced by the plant to make them unappetising to predators – like us, as well as caterpillars. 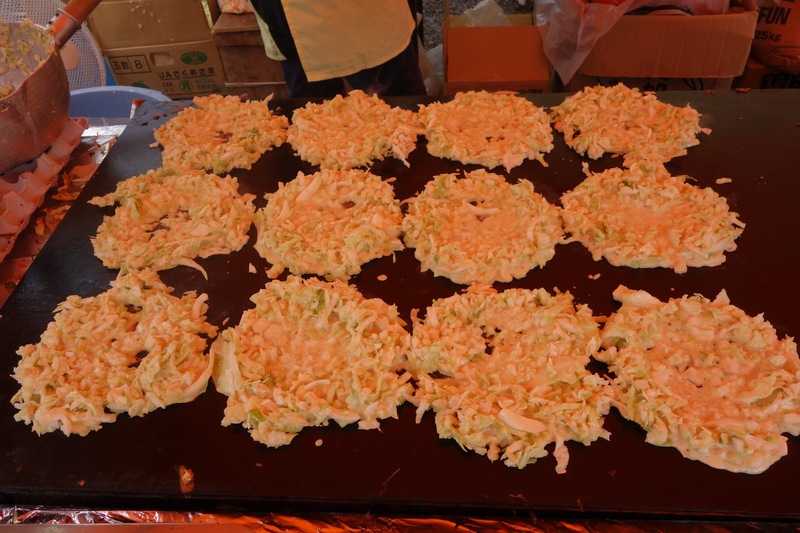 Sulforaphane is one such protective phytonutrient that gives them the particular sulphur smell. 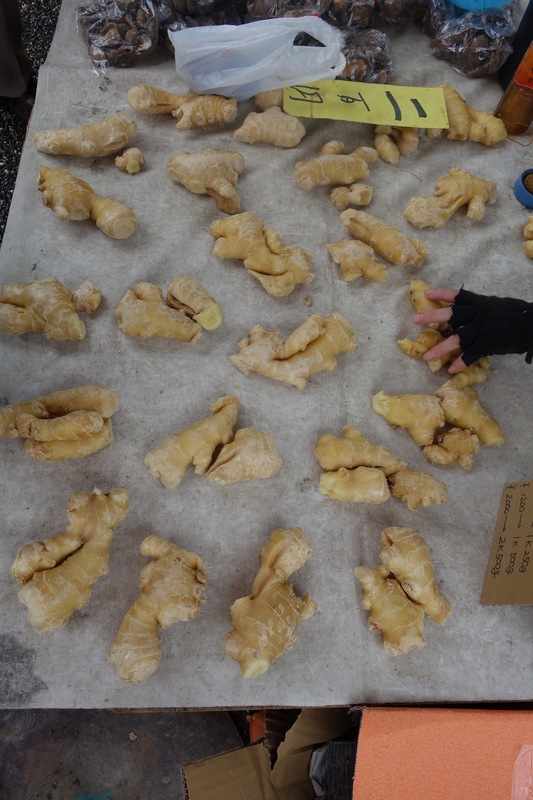 It has anti-cancer functions and is an antioxidant. I usually have a small nibble on what there is in the garden, snapping it off and eating it raw while I wander around, weeding and watering, crunching and chewing as I go. They must be good for me? 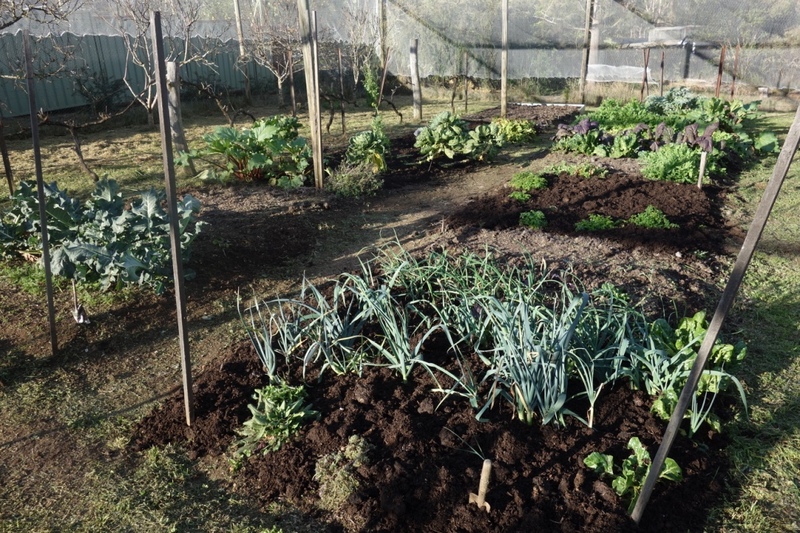 I really like the idea of going to the garden each day/evening and picking what needs eating on that day, because it is absolutely ready to be picked, organically grown and totally fresh. This is self-reliance, living with the seasons. Best wishes from Steve and Janine, who are vegging out in the late winter. The weather has turned somewhat balmy after the snow. Maybe spring is on the horizon? 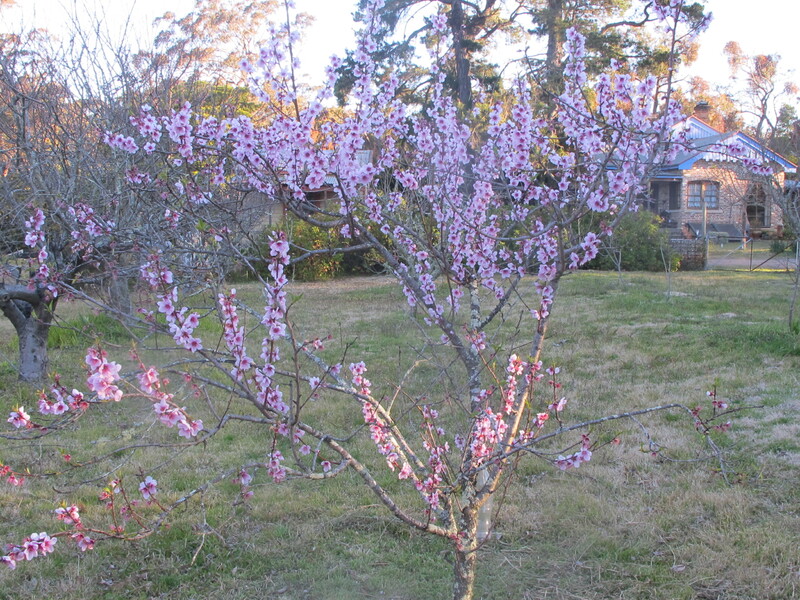 Many trees are now in bud and the earliest peaches, plums and almonds are in flower. 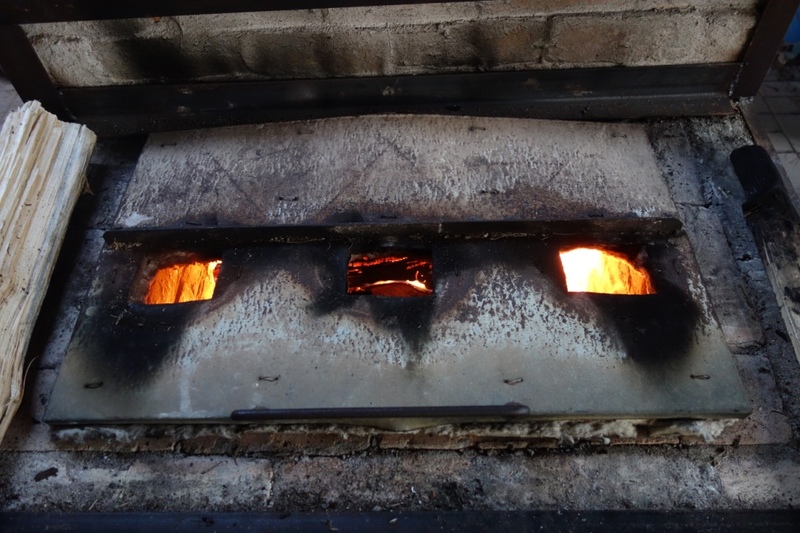 I get up very early to start the firing in the wood fired kiln. It’s 4am. It’s bitterly cold and there is a crunchy frost that I can’t see in the pitch darkness of the very late night/early morn, but I can hear and feel it ‘crunch’ underfoot as I walk down to the pottery. The firing goes well enough. Pretty well straight down the line as expected. It ought to, as this is the 23rd firing of this version of this iteration of this kiln. 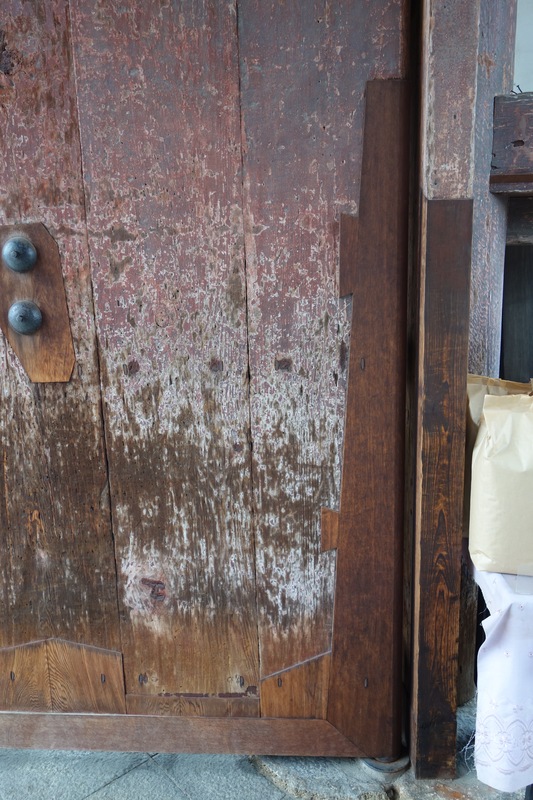 Before I could pack the kiln, I had to crawl inside the fire-box to chip out the build up of ash glaze slag. This is fairly normal, but this time I also had to chip out the stump of a snapped off hob brick, that broke off during the last firing and dropped into the firebox. A tricky job as the space is pretty limited, there isn’t much room to swing a hammer in there. In the past I have drilled several holes into the brick and then broken it into smaller pieces that I can chip out. It happens every few years. This time I try something different. I decide to drill a hole from the outside of the kiln, into the spot where the back of the broken stub of firebrick ought to be. 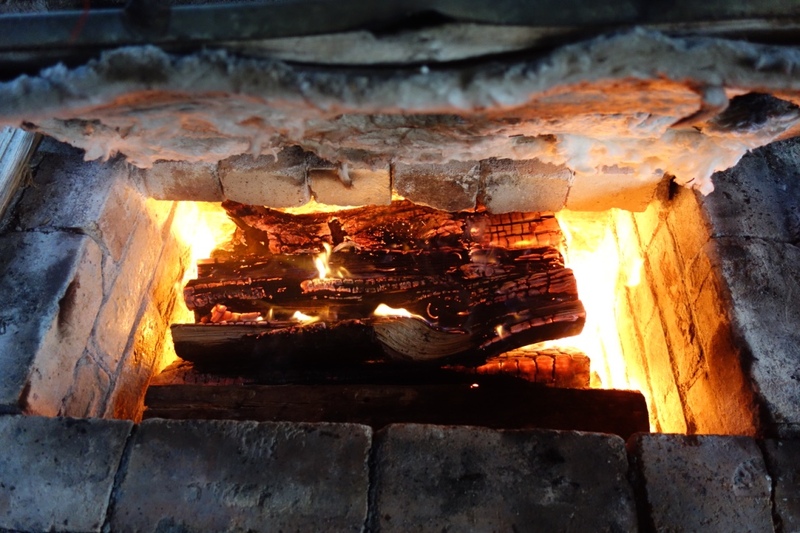 I line it up pretty closely and then using a metal rod, I hammer the old firebrick remnant out of it’s hole, where it has been sitting glazed in tight with all the wood ash for some time. It obliges me and slowly lets go and comes out of its socket fairly easily in only two pieces and a lot of small rubble and spalls. Maintenance seems to take up and extraordinary amount of my time at this end of my life. This job has gone well, but others are waiting and ongoing. 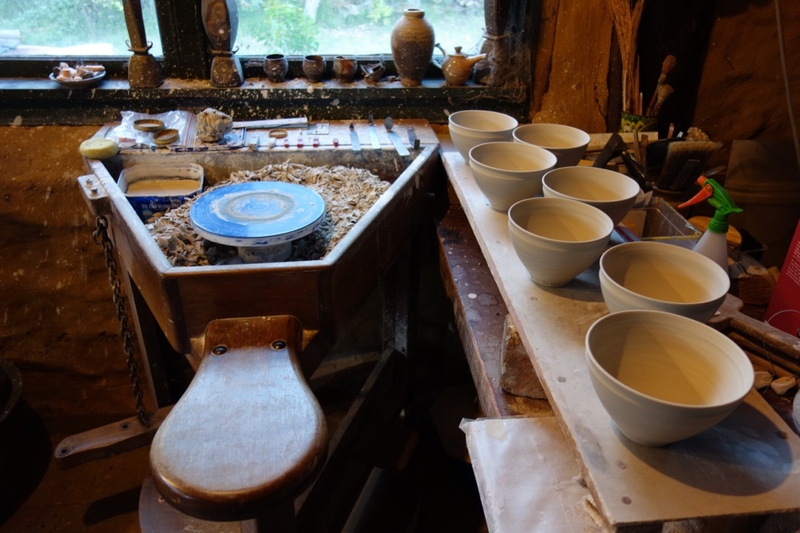 The kind of wood firing that I have developed is quite sedate and well paced with plenty of time to do small jobs, clean up and put away all the tools used in the packing. I sometimes do small maintenance jobs, but they have to be very simple. I can’t afford to get too involved in anything other than the process of firing. I certainly have time to sit and think, plan and ponder. It’s so luxurious to have time to just sit and think. I can afford this luxury, precisely because I have made sure that I have all the necessary wood fuel, and more, cut, split and stacked inside the kiln shed before I start the fire. I make a mental list of all the repair jobs that are waiting to be attended to. I need to replace the last piece of plastic crap that has recently snapped off the pottery roof. This second piece of plastic crap storm water gutter head has also disintegrated and fallen from the pottery roof, just a couple of months after the first one. (see; “Note to self: Don’t buy plastic crap” Posted on 04/05/2015 ) I swore that I wouldn’t buy another modern plastic one, and I won’t. 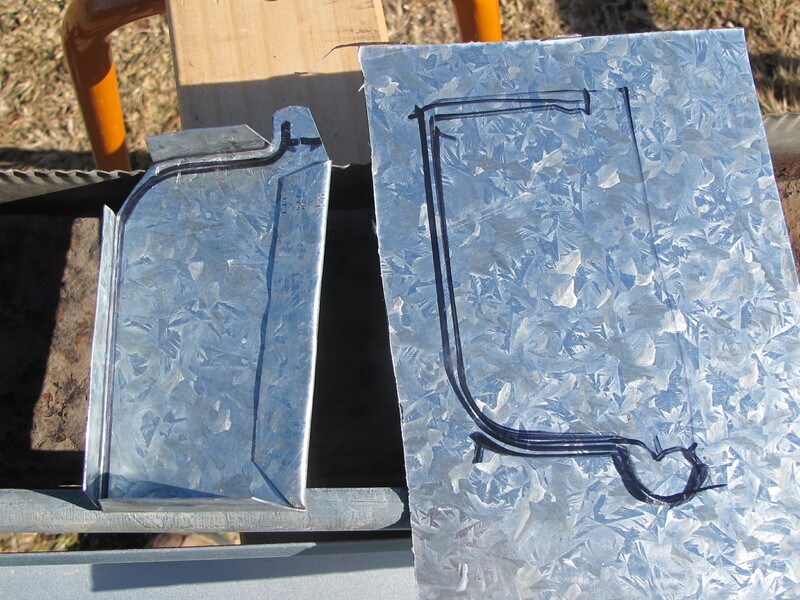 So I take an hour off and make a new one out of stainless steel off-cuts from the kiln factory. As it’s my second one in two months, I can still remember how I made the first one and this one goes very quickly, as I avoid all the mistakes that I made inventing and making the first one. The upper face has to be raked back at an angle of 45 degrees, so that it can be fitted with some stainless steel mesh that acts as a leaf deflector. The list of jobs is endless. 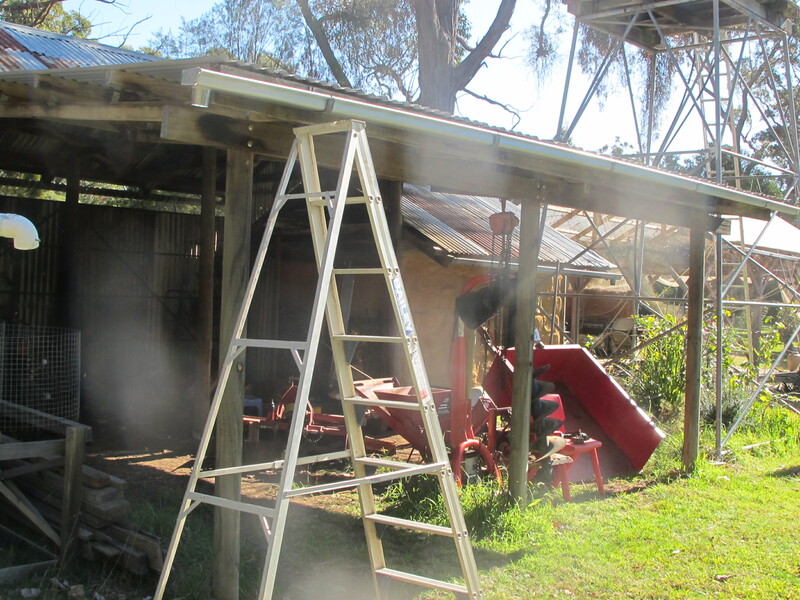 Now, the guttering on the wood shed has rusted through with all the leaf litter that blows onto that roof from the tree cover. 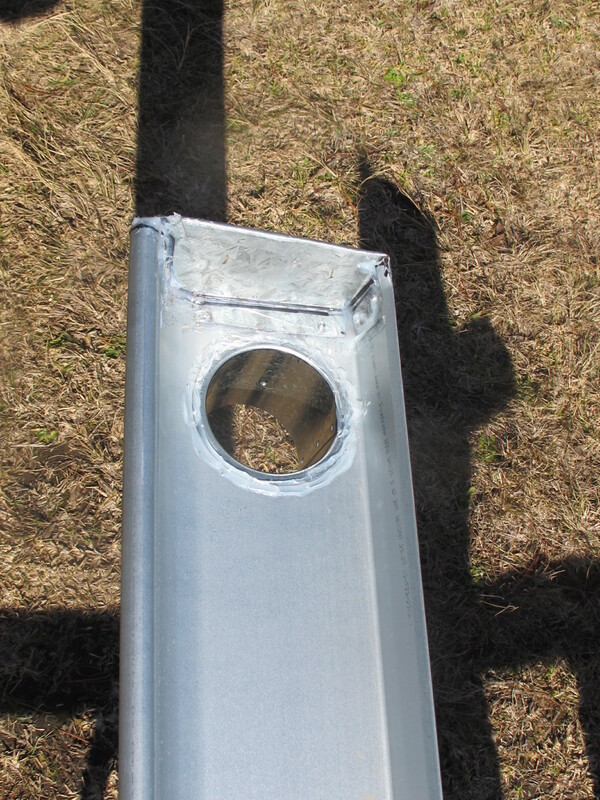 I make a new gutter and fit it up. I’m proud to say that I don’t buy prefabbed stop-ends and down-spouts. I was shown how to make them by one of my mentors. Joe Enfield, the local village plumber 40 years ago. 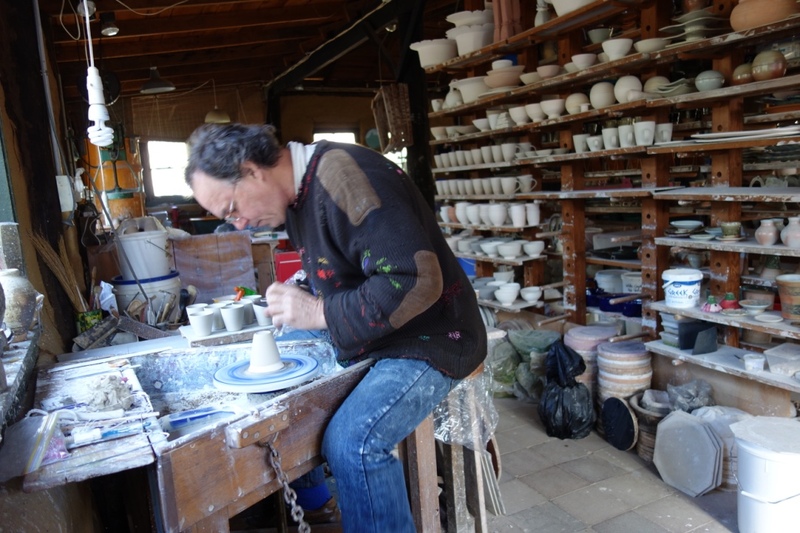 I worked for him as his labourer/assistant for a couple of years when I first came here and didn’t have a proper house and certainly no pottery workshop or kiln. 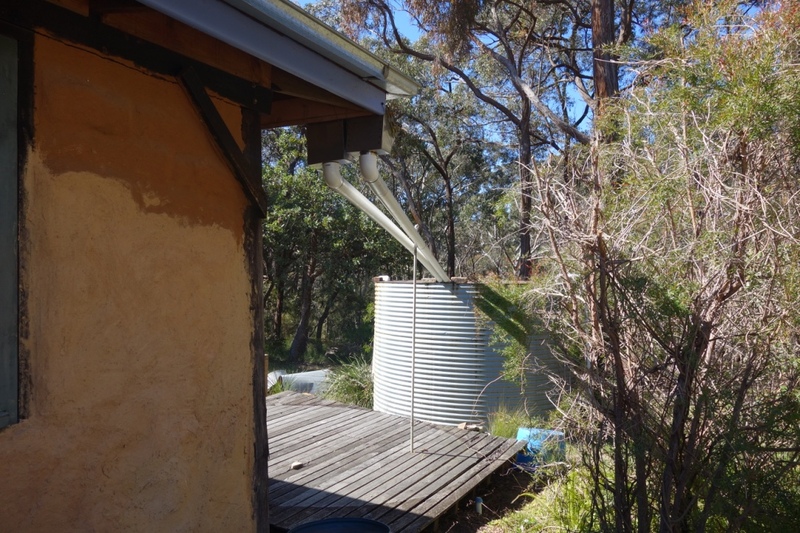 It took me a couple of years to get established again here after we were burnt out in a bush fire in Dural, where we had been renting a place. I learnt a lot working for Joe. I was only employed on a casual basis on bigger jobs, or where there was crawling under-floor work or a lot of ladder work, as Joe was in his 60’s and close to retirement. He wasn’t obliged to teach me anything, That wasn’t the deal, but we got on well together and he invested a lot of time in me because he could see that I was keen to learn. 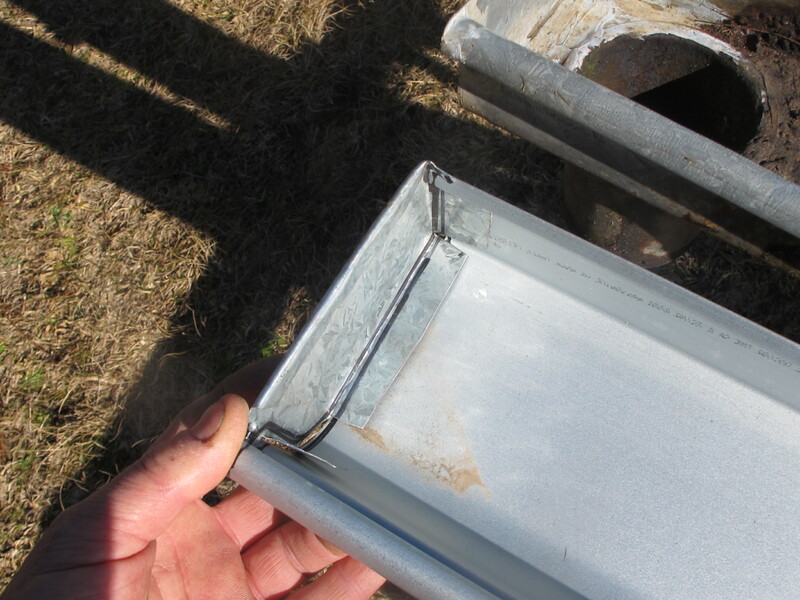 I don’t make very good sheet metal work, roof flashing or plumbing, but what I do works and doesn’t leak. I work in the old fashioned way that I was taught by Joe. One of the last of the ‘Old School’ plumbers who still knew do all the old hand skills. I’m often in at the plumbers wholesale suppliers. They know that I’m not a plumber. I ask all the dumb questions about taps and toilets etc. I only have an account there because I buy a lot of gas fittings for my kiln work. So when I get a length of guttering, but decline the stop ends and down spouts, that are usually sold with it, they question me about it. 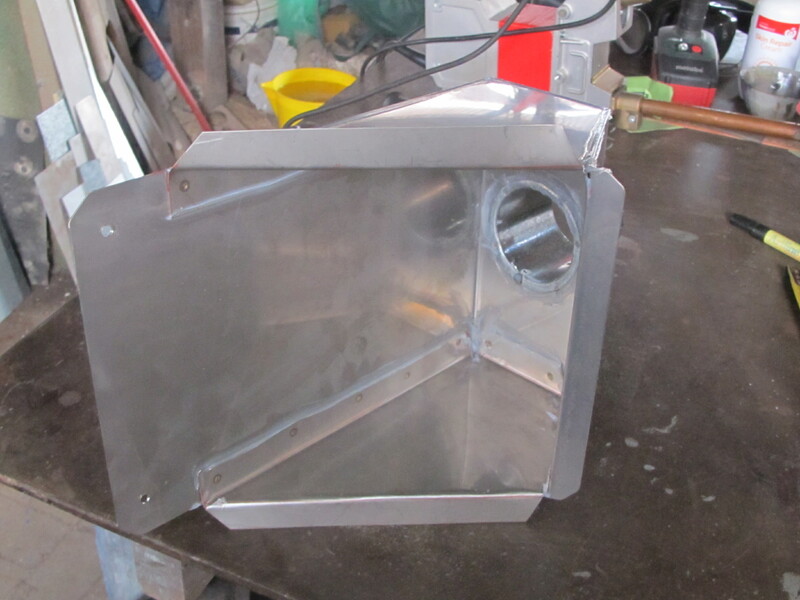 All the plumbers buy the prefabbed parts, why don’t I. I’m proud to say that I can make my own from off cuts, scrap and leftover bits. Just the way that I was taught. 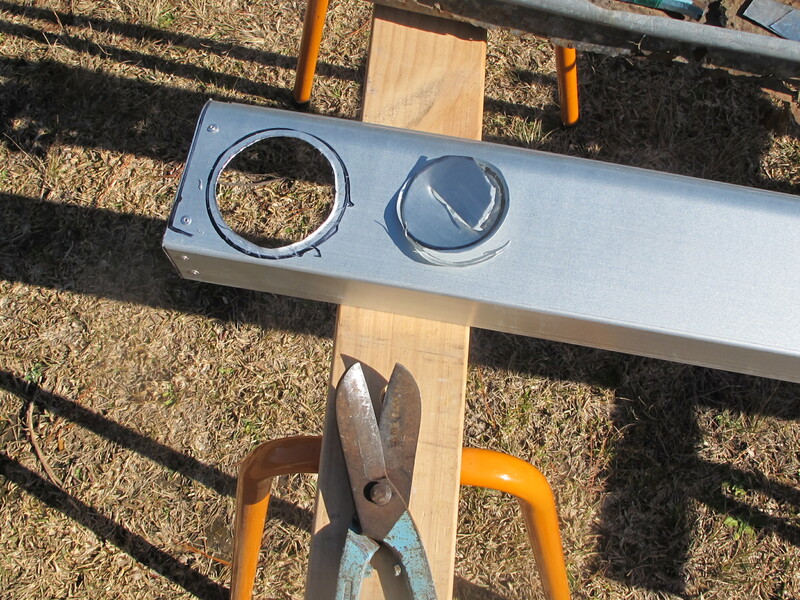 Sometimes I end up making the parts out of stainless steel – because I can! 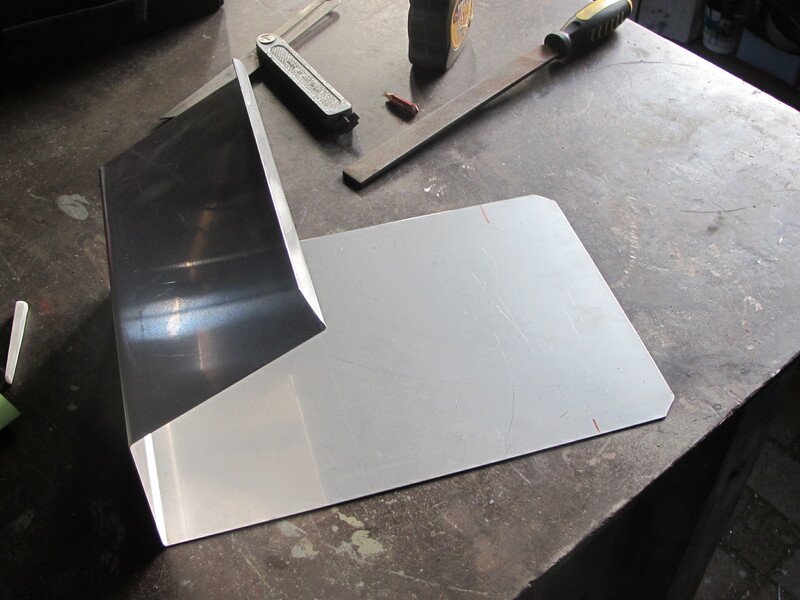 I have more stainless steel off-cuts than galvanised metal to work with. The firing proceeds slow and steady all the way up to top temperature. It turns out to be a glorious warm day with no wind. This firing, I go to 1320oC. Cone 11 down in the hot spot. 16 hours to top temp and then a 2 hour controlled burning down, until it is safe to leave it to cool naturally. I have my friend, Jim Black here throughout this firing. He helps me pack the kiln by rolling out all the little balls of wadding. During the firing, we sit and chat and solve all the worlds problems while we watch the kiln fire itself. Getting up every so often to stoke more logs into the firebox as necessary. We’re quite ready for bed when it’s all clammed up at 10pm. The next couple of days, while the kiln is cooling, I have my other friend Warren here to help with the winter pruning. 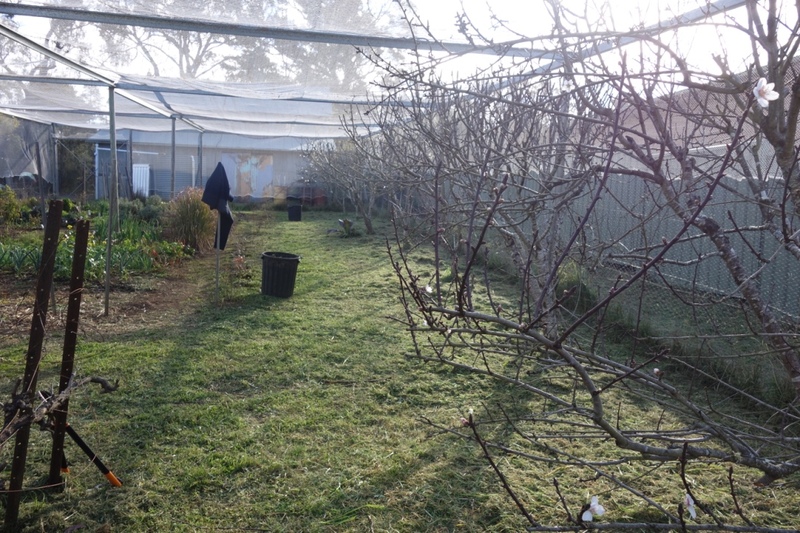 We get stuck in and prune all the almonds, blue berries and grape vines, trim the hedge and then weed and mow all the almonds, vegetable garden and citrus grove. it’s a long day, but well worth it when we look back after it’s finished. Everything in there is in good shape for spring now. 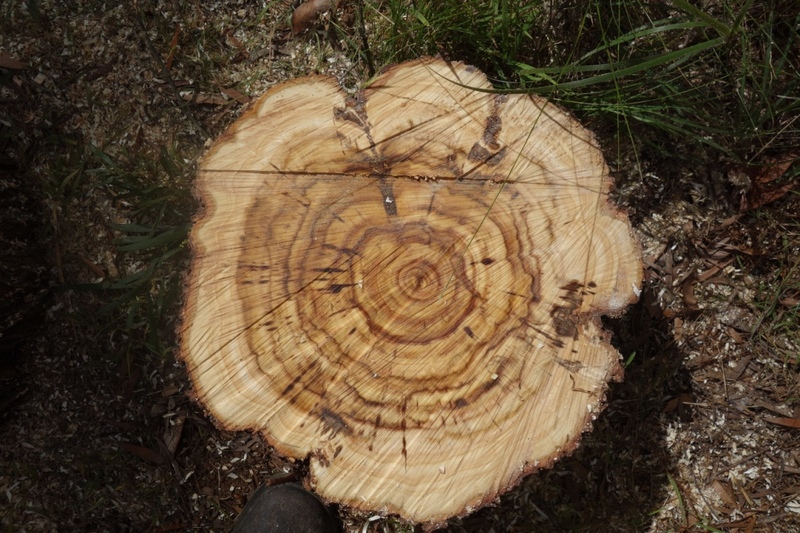 The next day we take down some ageing wattle trees that are over hanging the fuel shed. 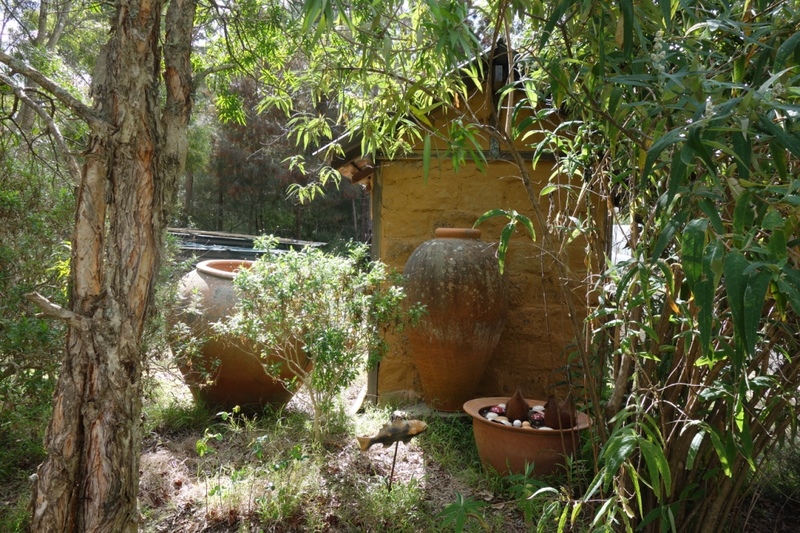 Its a slow process, because there are three big terracotta pots under these trees. One of them is from the Parliament House Project, from back in 1988. To drop these trees safely, I need to eliminate the weight of the upper branches, in the right places, bit by bit, by taking off one branch at a time, until each tree is whittled down to a trunk that can be chained to the truck and winched over in the right direction, so that it falls safely into a vacant space in the garden. The trunk and larger branches are then cut up into small kitchen-stove sized lengths and wheelbarrowed over to the wood shed to season for a year. The three trees take us all day to deal with and then clean up all the mess. While I’m in a gardening mood, I optimistically decide to plant out a few carrot and beetroot seeds. Maybe it’s a little bit early yet, but it somehow seems to be a little warmer and the days are certainly getting longer. 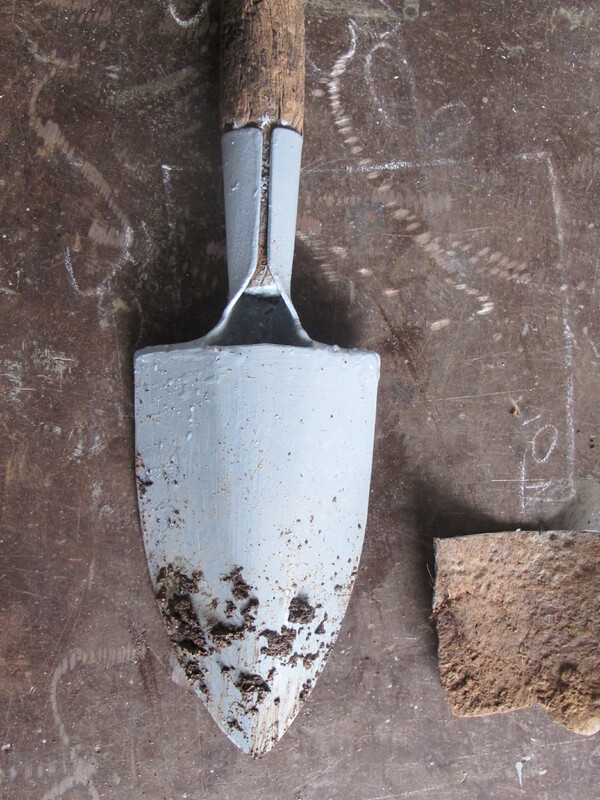 The garden trowel has completely rushed away at the end, by being left stuck in the soil while not in use. It’s rusted away down to half its length. I should have looked after it better. It’s only lasted 18 years. 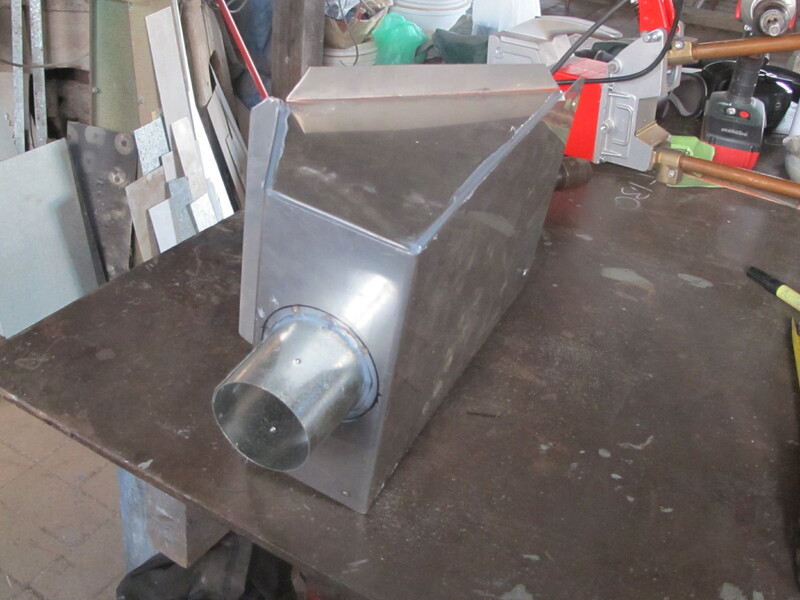 I make a new blade for it out of galvanised steel sheet, weld it on and give it a few coats of zinc paint. lets hope i get another 18 years out of it. I suspect that the old hardwood handle won’t last that long? Self reliance is all about making do and doing with what I can make. This is just one more of the many jobs that have been on my to-do list for some time now. I seem to cross one off and Janine adds two more. We can never get to the end of the list, but it’s fun trying and doing most things ourselves. It beats working for a living. So it’s tax time. Something to cheer up this dreary, dull, cold time of the season. I have my tax return back, and the good news is that I have earned a couple of thousand dollars more than last year. 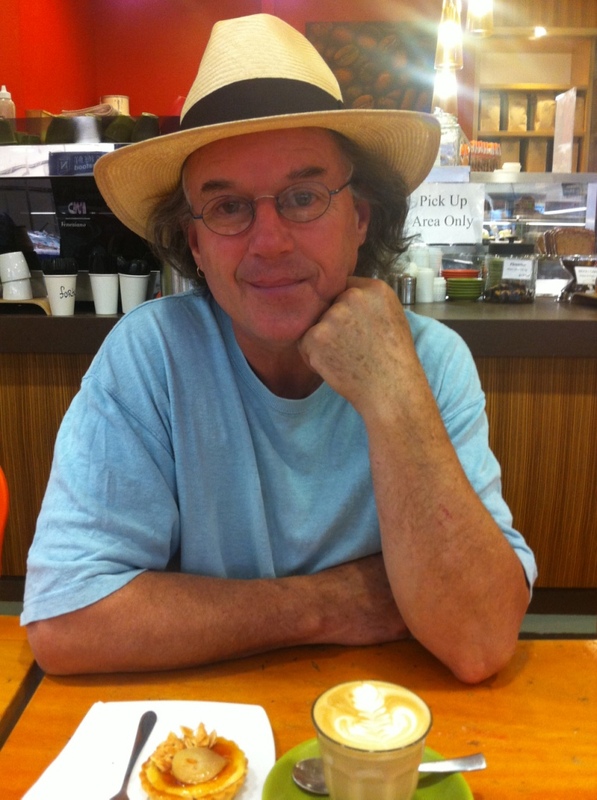 I was listening to Philip Adams recently, on the Late Night Live replay. I was packing the kiln and the radio was on to keep me company. It filled the back ground space. I tuned in to this guy that Philip Adams was interviewing. He and his wife have dedicated their lives to the good will of others. He is a philosopher and his wife is a doctor. They have formed a web site that encourages the reader to re-think the way that we pay a proportion of our savings to those less-fortunate than ourselves. Following their links I learned that I am in the top 8.6% of the worlds population. and that my income is greater than 13.6 times the global average. I was a bit humbled by this. I regularly give 2% of my income to charity. This is pretty pathetic, but I believe that it is widely accepted that this is the minimum amount that a well-fed person in an advanced western economy should be able to afford to give. I recognise that I am very well-off. I’m not doing enough, but I thought that I was doing what I could easily manage. I have now been eased into thinking that I could do more. Perhaps I’m a bit self-complacent, and just a touch lazy and out of the loop of knowing what life is like in the third world. I have some inkling, but I don’t spend any time dwelling on it. As I have raised my income up from 32,000 PA to 34,000 I decide to give 10% of this extra income to charity. Small fry, but it is some sort of gesture. I know that I am really comfortable in my life and I should do more, but I want to do lots of things. So I settled on this amount. It’s what I can live with. I can’t give 40% of my income like these amazingly committed couple, I have already honed my lifestyle down to a pretty frugal minimum, but 10% of my excess above my usual standard income. I can live with that. I have been giving to several charities over the years. I give them a nominal amount each time they ask, and then they ask for more, I give them my donation and the cycle repeats. I give many small amounts to a lot of organisations. Last year I decided to give each of the charities $100 each in a one-off payment for the year and then nothing else, for 12 months. In response, I Immediately got in the return mail $100 worth of glossy advertising material posted out to me. Clearly I had made a very big mistake. When I sent $25 each month to each of these charities. I didn’t show up on their radar at all. just small fry, to be ignored. But, when I increased my donation level up to $100, then I was to be considered a contender to be milked for a larger amount. Trying to get me onto a regular, larger, automatic donation. As I don’t have any regular income, I can’t commit to any regular payments. I can only give when I know that I have it in the bank to be able to do so. I can now see that my effort to do ‘the right thing’, was mis-interpreted by the charity cash-raising industry that is employed by the charity organisations. Without a salary, or any ‘regular’ income. I can’t afford to give a large sum regularly. I can see now that giving a larger amount was a mistake, because I gave $100 in a lump sum to the charity and got $120 worth of glossy paper encouraging me to give more, now! I declined. I realised that I wasted my small amount of precious money, on that occasion. This year I decided to give the total amount in one lump sum to a local charity, that is so small that it doesn’t even have a glossy brochure. Its mission is to build a home for the care of challenged people who need help and support. It is organised, by the parents of these children/adults , such that they might be eased out of their ageing parents homes and into a supportive environment, in a caring way, so that they might be able to become self-supporting eventually. It’s a brave venture and I believe, worthy of support. It’s entirely locally organised by and for these local people. I sent off all my money and what do you think that I got in the mail the very next week? Thankfully, all I got in response was a receipt! I hope that this money is well spent and that the venture is completely realised in the fullness of time.